Qui n’aiment pas les fantômes et des vampires économise-t-il pour leurs malheureuses victimes ? Si vous êtes en quête d’une activité nocturne en famille à la Nouvelle-Orléans, alors cette balade de fantômes dans le quartier français fera peut-être monter votre pression. Avec un petit groupe, vous flânerez dans les rues obscures pour une balade amusante et historique de la Nouvelle-Orléans, en écoutant des récits d’une invincibilité morbide et des âmes revenus à la vie. Didn't know what to expect on this tour. If you're into ghost and vampire story's this is the place to visit. Bobby Thomas was the best ghost and vampire story guide. Keep it funny and serious about the story's. 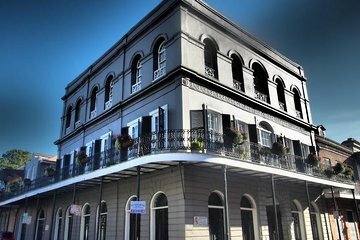 A must be place to visit in new Orleans. Great tour, lots of history given. Tour guide was very funny and knowledgeable. We did this the first day we arrived, as the week went on and we walked around it was nice to go back and visit some of the spots she talked about. Dartania rocks! So fun and I love the ghost stories! This was not a scary tour and would be appropriate for older children. Evian was a great tour guide and story teller. We actually couldn't find the lounge on our scheduled tour date and missed our tour and they were nice enough to allow us to attend the tour instead on Halloween. I enjoyed the history of the city and the stories that were shared about the heritage, I was however a little disappointed in the lack of spooky being Halloween. Malika was a great story teller. Really enjoyed this tour. Very fairly priced. Good tour, very informative guide, would recommend!! Fun tour. Plenty of ghost and vampire stories. Our guide was fun.